Google Webmaster Tools is something that nearly every webmaster and blogger has been using for years. You're not a webmaster unless you know your way around Google Webmaster Tools, because it offers so many features, and shows so much data which I simply cannot imagine not having. One very important feature is the backlink profile for your website, with which you can find and repair your broken links for better user experience and SEO. Talking of which, Google has just improved this feature, which now provides enhanced backlink data - better than it did before. When you log into your Google Webmaster Tools account, and select a site, you can see, among various other options, a Search Traffic section in the sidebar on the left. 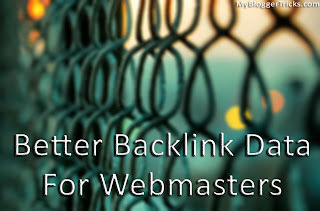 This section provides useful and insightful backlink data for your website. If you click on the Links to Your Site button, you will be able to see a collection of backlinks to your site. Previously, Google Webmaster Tools only gave you around 100,000 backlinks for your website when you clicked on the "Download more sample links" button. If you had more than 100,000 links, then this was only a subset of your entire backlink data, organized lexicographically, or alphabetically. So suppose if you had a lot of links from a domain that started from the letter 'a', or 'b', (etc. ), then you would miss out on a lot of backlinks from domains lying in the lower end of the alphabetical spectrum. Now though, more of the links are now sampled uniformly from the full spectrum of your backlinks. This means that you're less likelier to miss out on a particular domain. You will now also get more example links from different TLDs (top-level domains). All the links will be sorted alphabetically ofcourse. Starting soon, when you download your data, you'll notice a much broader, more diverse cross-section of links. Site owners looking for insights into who recommends their content will now have a better overview of those links, and those working on cleaning up any bad linking practices will find it easier to see where to spend their time and effort. These changes are currently being implemented, so you can expect to see them anytime soon.